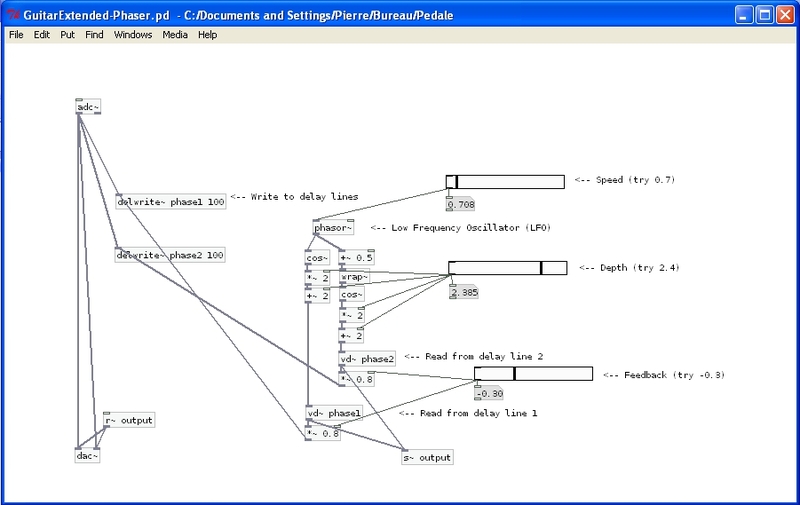 It is pretty easy to build a simple phaser/chorus effect for the guitar with Pure Data. I encourage you to learn a little bit about the basic principle of this type of effect before experimenting from the patch. To make it short, it uses a copy of the dry sound of your guitar which is fed into one or many delay lines. The pitch of the copy is made to oscillate around the initial value by reading from the delay lines with a LFO (Low Frequency Oscillator). The copy is then added back to the dry signal. The 3 sliders to the right control the speed of the oscillation, it’s depth, and the amount of feedback in the delay lines. Please not that these sliders are not supposed to be moved while playing (you’ll hear some unwanted noise). You can download the patch here (again, i strongly recommend copying the patch from the image above). This entry was posted in Simple effects and tagged chorus, effect, guitar, pd, phaser, pure data. Bookmark the permalink.